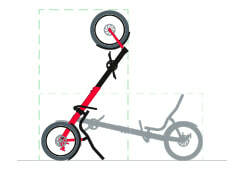 Trike Concepts: two wheels in front or in back? Among the different wheel arrangements available in the recumbent trike market, the "Delta" geometry used byt Hase Bikes stands out as offering a wide range of unique advantages. 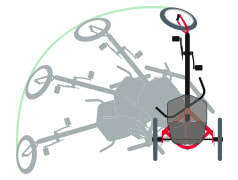 The "Delta" principle entails two rear wheels and one directional wheel at the front. 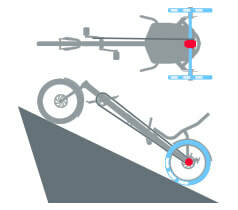 This means that the rider is seated between the front and rear axle. Below we list some of the key arguments in its favor. A small turning circle is very useful when riding along sinuous roads and when parking the bike. Ground clearance is crucial for any off road excursion. In an urban context, where steps and ramps are to be found, ground clearance is also an important component of safety and accessibility. Great clearance to access the seat. All Hase trikes are capable of vertical parking, allowing the bike to be stored in tight spaces. When combined with a differential, the two wheel drive (2WD) offers a unique uphill performance, no matter the terrain. Two Hase trikes can be attached together. The top handle bar offers direct steering and a wide range of adjustments. The feature gives the rider better control on the shifters, brakes and motor display, and a better view of the road. Higher seat offers better visibility to other vehicles.